THE 15th Symposium of Australian Gastronomy was held in the Huon Valley in Tasmania, where amongst other delights, we enjoyed an excellent scallop pie. 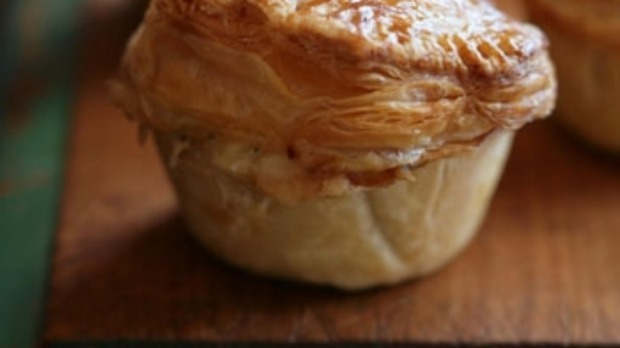 Tasmania is famous for its scallop pies. Some taste like rubber balls in glue. This baby pie was in a silky veloute sauce and the crust was buttery and crisp. Delicious. Add chopped butter and process briefly until broken up and just coated with dry ingredients. Add water and pulse until pastry comes together. Turn on to workbench, gather and flatten into a disc. Dust with flour and chill at least one hour. Wipe scallops, remove any wisps and the black intestinal thread and return to refrigerator until needed. Heat fish stock and pour into a jug. Whisk lemon juice, cream and egg yolk together in a small bowl. Melt butter, and when foaming stir in the flour. Cook one minute, then gradually whisk in the hot stock. Stir, bring to the boil and simmer for two minutes. Add 1/3 of the hot sauce to the egg-yolk mixture. Stir well, take off the heat and add the rest of the sauce. It will thicken quickly. Taste for salt and pepper and add the parsley and zest. Heat a small non-stick pan with the olive oil. Sear the scallops well on both sides (about two minutes). Lift scallops into a bowl. When they have cooled, spoon over enough of the sauce to make a thick mixture. Chill scallop filling while you deal with the pastry. Fill lined muffin tins with cold scallop mixture. Pack it in well. Brush edges with egg wash. Settle lids on top. Pinch edges to seal well. Paint with egg wash.
Bake 10 minutes and lower the temperature to 180C. Cook 20 minutes more. Allow to settle before serving.